Figure Caption Microstratigraphies in late Pleistocene varnish samples from radiometrically dated geomorphic features in the western US drylands. Age constraints are reported in ka and letters in the varnish images correspond to those in the age calibration figure. 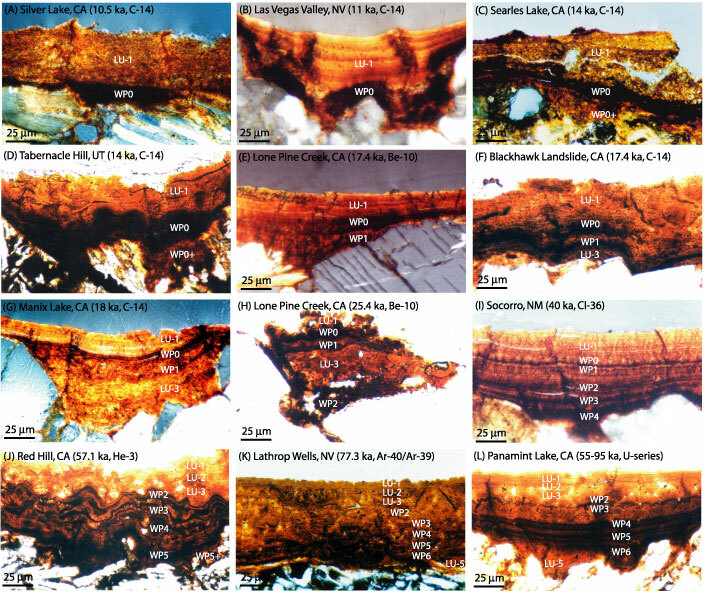 Note that black layers WP0 and WP1 in images J and L and WP2 and WP3 in images L have been altered to orange layers by postdepositional chemical leaching. Please see Liu (2003) for more discussion on this topic. LU = Layering Unit, WP = Wet event in Pleistocene.